Capital of the kingdom of Servia, situated at the confluence of the Save and the Danube. After Sultan Sulaiman the Magnificent had captured the city from the Hungarians in 1522, the Turks remained in possession until 1867, when they withdrew their garrison. The House of Austriatook the city from them three times within as many centuries, retaining it each time about one or two years. Probably a Jewish community existed at Belgrade before the Ottoman conquest. In any case, a large number of Jews established themselves in the city during the reign of Sulaiman, owing to the influence of Joseph Nasi, who obtained similar privileges of residence for his coreligionists in Bosnia. These facts are evident from the responsa of the learned rabbi of Salonica, Samuel b. Moses de Medina, a contemporary of the events. The community of Belgrade pursued a quiet existence. At an early date a printing-press was established, from which many works were issued. Toward 1620 the learned Talmudist Asher Zebulun lived there, and later removed to Sarajevo. 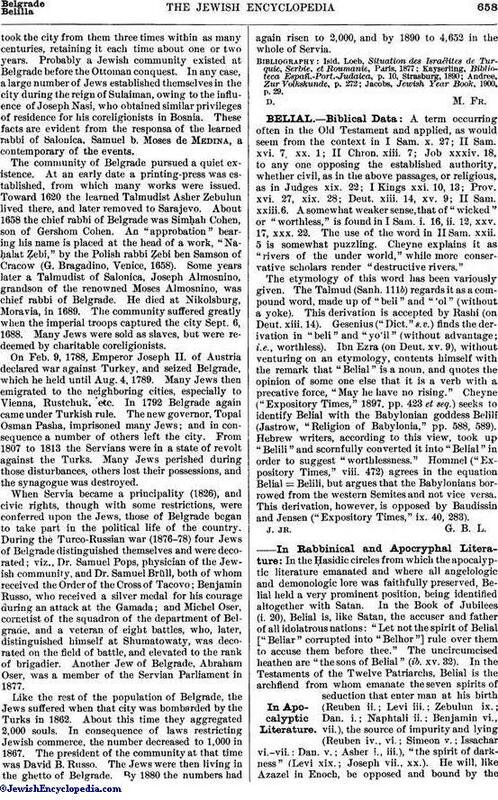 About 1658 the chief rabbi of Belgrade was Simḥah Cohen, son of Gershom Cohen. An "approbation" bearing his name is placed at the head of a work, "Naḥalat Ẓebi," by the Polish rabbi Ẓebi ben Samson of Cracow (G. Bragadino, Venice, 1658). Some years later a Talmudist of Salonica, Joseph Almosnino, grandson of the renowned Moses Almosnino, was chief rabbi of Belgrade. He died at Nikolsburg, Moravia, in 1689. The community suffered greatly when the imperial troops captured the city Sept. 6, 1688. Many Jews were sold as slaves, but were redeemed by charitable coreligionists. On Feb. 9, 1788, Emperor Joseph II. of Austria declared war against Turkey, and seized Belgrade, which he held until Aug. 4, 1789. Many Jews then emigrated to the neighboring cities, especially to Vienna, Rustchuk, etc. In 1792 Belgrade again came under Turkish rule. The new governor, Topal Osman Pasha, imprisoned many Jews; and in consequence a number of others left the city. From 1807 to 1813 the Servians were in a state of revolt against the Turks. Many Jews perished during those disturbances, others lost their possessions, and the synagogue was destroyed. 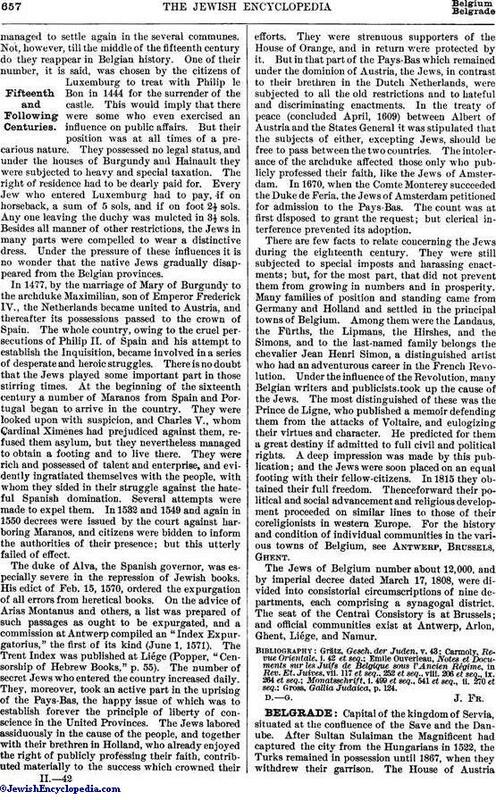 When Servia became a principality (1826), and civic rights, though with some restrictions, were conferred upon the Jews, those of Belgrade began to take part in the political life of the country. During the Turco-Russian war (1876-78) four Jews of Belgrade distinguished themselves and were decorated; viz., Dr. Samuel Pops, physician of the Jewish community, and Dr. Samuel Brüll, both of whom received the Order of the Cross of Tacovo; Benjamin Russo, who received a silver medal for his courage during an attack at the Gamada; and Michel Oser, cornetist of the squadron of the department of Belgrade, and a veteran of eight battles, who, later, distinguished himself at Shumatowaty, was decorated on the field of battle, and elevated to the rank of brigadier. Another Jew of Belgrade, Abraham Oser, was a member of the Servian Parliament in 1877. Like the rest of the population of Belgrade, the Jews suffered when that city was bombarded by the Turks in 1862. About this time they aggregated 2,000 souls. In consequence of laws restricting Jewish commerce, the number decreased to 1,000 in 1867. The president of the community at that time was David B. Russo. The Jews were then living in the ghetto of Belgrade. By 1880 the numbers had again risen to 2,000, and by 1890 to 4,652 in the whole of Servia. Jacobs, Jewish Year Book, 1900, p. 29.